Good news from 10th Street. A few days ago I was passing the VFW Post 9485, right by the subway entrance on Fourth, when I noticed that the door to the Post was open. Peering inside, I saw a figure in the shadows, behind the bar. He was waving enthusiastically. I had to go inside. After a long unofficial closure dating back to 2012 or so, - partly due to declining membership and partly (you would think) due to the dragged out viaduct & station work that kept the Post jammed in by scaffold - and a more formal shuttering in '14, it looks like 9485 is back. The vet on duty in the otherwise empty Post informed me that the place would be open again soon. He emphasized that it would by no means be a man cave - veterans of both sexes would be very welcome. 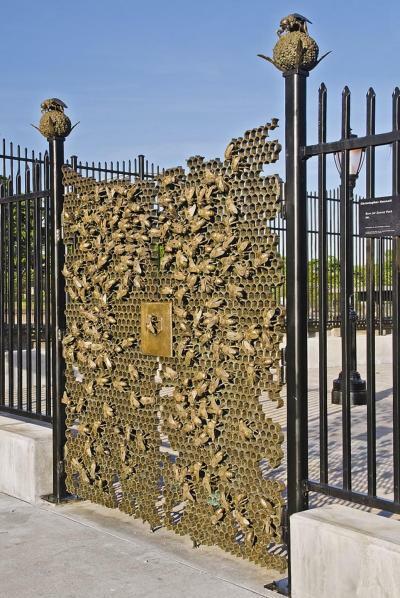 He also disclosed that a spruce-up was likely for the outside of the premises. As is normal in veteran halls, regular civilians will only be able to visit the post as sponsored guests, but the freshly painted party room will still be available to the general public. Members of my family are all-too aware of my long-standing wish to rent the party room. I've talked about having a party here so often that now the grown-up kids have started to share my dream. The room lies right below the F tracks as they make their way from the viaduct down, down to Seventh. It's a rumbling location that's perfect for a celebration. I stayed for a little while chatting to my host, who spun out a complicated tale of a journey down South to a party at a veterans' hall in Alabama. When he got there, dressed to the nines in formal clothes, he found that the hall was all locked up, and no other guests were around. He waited for a while across the street, outside of a Wendy's, where the presence of a loitering man in a tuxedo soon drew a visit from the cops. "But I'm from Brooklyn!" he finally cried, as he tried to explain his situation. It all got sorted out somehow or other, but the party itself was a washout. Here on 10th, the party prospects are more hopeful. It's great to know that 9485 - which operated here on 10th for fifty years - will be soon be ready to welcome veterans & their guests again. To the future! The Thunderbolt rollercoaster opened in 1925 and ran for nearly sixty years until it was razed in 2000. Beneath its wooden tracks was the Kensington Hotel, the fictional childhood home of Alvy Singer in Woody Allen's Annie Hall, and an inspiration to countless artists and photographers through the years. In reality, Thunderbolt owners Mae Timpano and Fred Moran lived in the Thunderbolt, their living room rattled by the coaster with every ride. The exhibition, which opened in November, runs through May 8th. Transgender performer Anohni (formerly known as Antony Hegarty) has been nominated for a Best Original Song Oscar this year, for her performance of "Manta Ray" from the documentary Racing Extinction. It's usual for the nominees in this category to perform during the awards show, but while Lady Gaga, Sam Smith & the Weeknd will be doing so, Anohni was not invited. This was rumored to be due to "time constraints" - hardly plausible given that there was plenty of time for Foo Fighters frontman Dave Grohl (not a nominee) to be scheduled to perform. Anohni has decided not to attend the Oscars ceremony, and yesterday she released a magnificent statement explaining her decision. You can read it here. Here's an extract. I was told during my 20s and 30s there was no chance that someone like me could have a career in music, and this perspective was reiterated by so many industry "professionals" and media outlets that I lost count. I almost gave up. Thankfully, fellow artists like Lou Reed advocated for me so intensely that I got a foothold despite the worst intentions of others. In that sense, I am one of the luckiest people in the world. I enjoy that wild and reckless exhilaration that comes from naming my truth as best as I can; it is what Nina Simone might have called a "boon." The truth is that I was not groomed for stardom and watered down for your enjoyment. As a transgendered artist, I have always occupied a place outside of the mainstream. I have gladly paid a price for speaking my truth in the face of loathing and idiocy. I'll forget the ceremonies & be sure to listen to plenty of Anohni's music tomorrow night. Here's a beautiful performance (fittingly with the late Lou Reed), from 2010. Candy Says. At least developers here are repurposing most of the old historic warehouse complexes, as opposed to ripping them down and building new glass towers in their place. However, as these buildings are renovated and leased to new types of tenants, and as thousands of new visitors and employees cross under the expressway for the first time, the destructive forces of gentrification and economic inequality may soon become unstoppable. Rents throughout the neighborhood are already on the rise, and new businesses catering to wealthier clientele are beginning to creep into the vibrant retail strips of Fifth Avenue and Eighth Avenue. As billions of private dollars are spent along the waterfront, how much investment will reach the middle-class residents living uphill, who are struggling to withstand this wave of change? Michele Carlo (writer/performer) has performed across the U.S., including the MOTH’s GrandSLAMS and MainStage in NYC, on NPR with Latino USA and appeared in the 2015 Emmy award-winning PBS documentary “Latino Americans of NY & NJ.” She is also the author of Fish Out Of Agua: My life on neither side of the (subway) tracks, a NYC-based memoir. 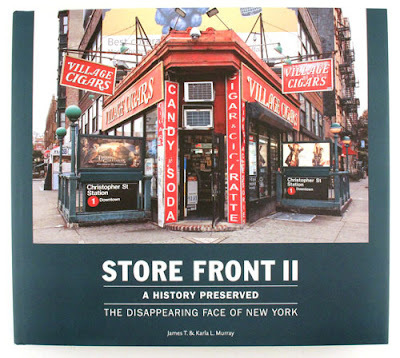 A few weeks ago I was given a copy of James and Karla Murray's latest book Store Front II: A History Preserved, a follow up to Store Front, which was first published in 2008. The books pay tribute to the small, independent, family-run & rapidly disappearing businesses of New York City, with page after page of glorious images. Some of the photographs show businesses anyone even briefly acquainted with the city would know, while others are landmarks only in their own neighborhoods. Some of the businesses have been in the same family hands for generations, while others have been handed on to other guardians. All of them are beautiful - dressed up in neon, inscribed with swirling, hand-painted fonts, or announcing their identities with neat rows of three dimensional plastic lettering. Worn by decades, perhaps the neon sign no longer illuminates, the paint is faded, or a letter or two, or three, or four, is lost. They're no less lovely for that. You'll find your own favorites immortalized here, and you'll see others you want to know better. I was especially excited to see Dyker Heights bakery St. Anthony's. I have my own pictures of more than a few of the stores in the books, though they're nothing in comparison to the Murrays' work. On the local front, Timboo's, Luigi's, Garry jewelers, the Record & Tape Center, and Eagle Provisions are represented here, both in photographs and text. Luigi's Giovanni Lanzo talks of the family farm in Staten Island, & the identity of that No Man's Neighborhood sandwiched between Park Slope and Sunset Park. 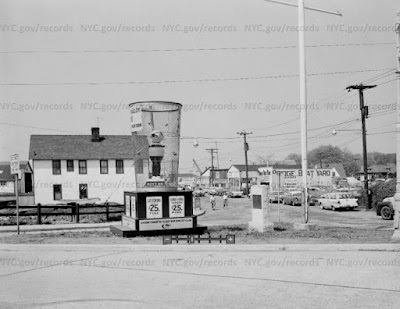 Garry's Michael's Garafola remembers a block by block neighborhood of Irish, Italian, African American, and Puerto Rican families. Anthony Mignone, owner of the Record & Tape Center, looks back at a presence on Fifth dating back to 1965, and envisions a forced retirement when his landlord takes over the space. 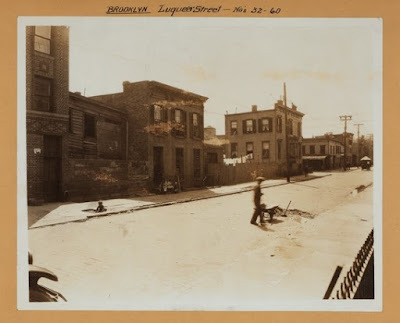 One of the Eagle Zawisny brothers, Richard, describes tougher days on the avenue, with the Mafia active on the scene, and remembers morning walks from his car to the store, meat cleaver firmly in hand. Sadly, three of these businesses are no longer operating. With their photographs, and the beautifully written prose that accompanies them, the Murrays remind us how important small businesses are to our lives in the city. How they anchor communities, enrich street life, and mark the history of the waves of immigrants who have made New York their home. They're why we love to live here. 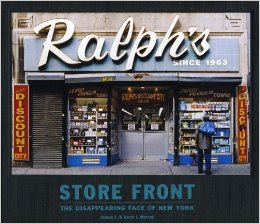 Sadly, many of the stores you'll find in the books are no longer with us - a consequence of rising rents, lost leases, changing demographics, or the end of a generational shopkeeping line. Chain stores sweep in to take their place. If you care about the future of small businesses, and you'd like to do something to protect them, visit #Save NYC, & see how you can help. One of the steps you can take is to sign the petition for the Small Business Jobs Survival Act, which would allow commercial tenants to negotiate fairer lease renewals. And of course, treat yourself to your own record of the city's marvelous retail legacy. Buy the books! past P.C. Richards (where a massive high-rise development is on the cards), I made my way to the Pacific library, reprieved (for the moment) from its own development BPL sell-off nightmares. If the the impending sale of the Cadman Plaza library goes through, along with its redevelopment as an apartment building with reduced-in-size new library space, the BPL has stated that part of the profits will go towards Pacific branch upgrades, but some remain sceptical of the Library's long-term goals for the branch, which sits in prime real-estate territory. 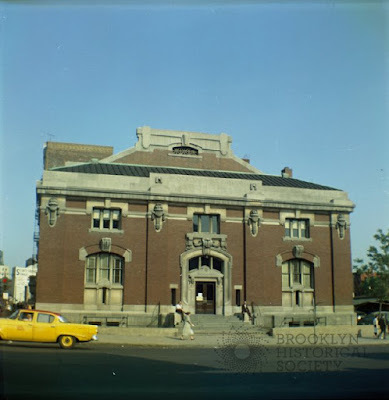 I'm closer geographically to the Park Slope branch but I always feel more at home at Pacific, the first Carnegie library in Brooklyn. It's a beauty of a building, & even though its panoptic design was inspired by less than charitable motives (keeping an eye on those dodgy readers at all times), its layout also makes the place feel intimate. 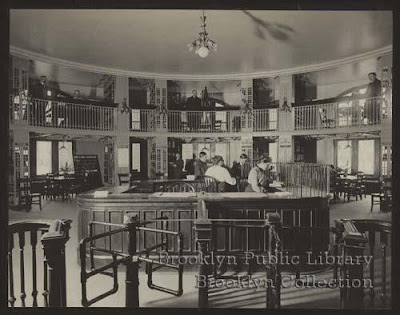 Yes, They could watch You, but you can look all around the place today and observe the working life of a well-loved library. Despite having been neglected over the years, victim of an underfunded system, and institutional mismanagement (some might say malfeasance), Pacific provides terrific service to children & adults alike, and for a small branch it provides a broad & thoughtfully selected range of reading materials. It does a whole lot with a small budget. If I walk into the "most pretentious" Park Slope Carnegie branch & glance at the New Books shelves, there's barely anything that catches my attention, but at Pacific I can always find something interesting. Today I picked up early Capote stories and a memoir of Francis Bacon, but I could have taken half a dozen volumes home, just from a couple of bookcases. At this branch, the art of browsing is still alive (take that, Josh Nachowitz!). And a shout-out to the lovely librarians here - always helpful, and responsive to the readers. Libraries are vital to the communities they serve. Libraries are vital to democracy, and in today's turbulent political times, they're more important than ever. We can't afford to lose a place like Pacific. We can't afford to lose any of our libraries, or see them reduced in size. Too many earlier posts on libraries - here are a couple. 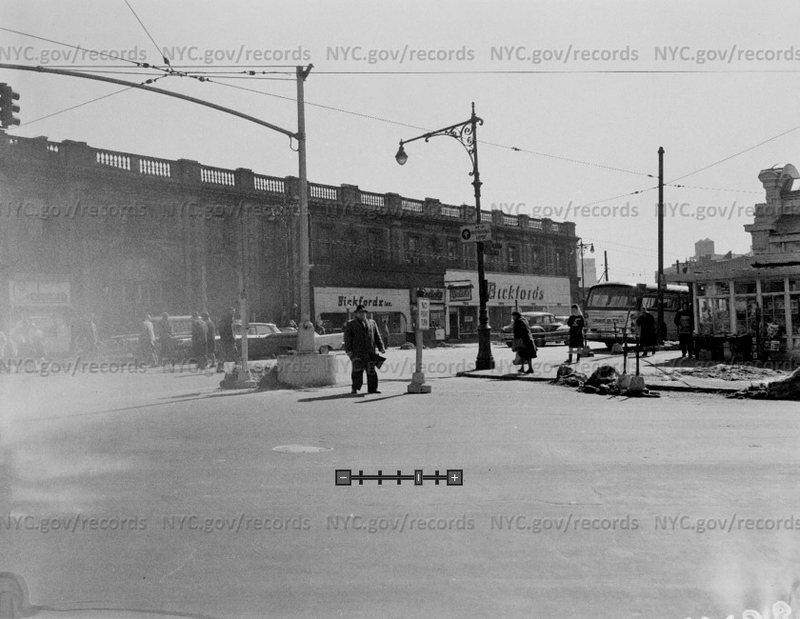 13th Street, looking towards 14th (Sixth/Seventh). Resurrection Coptic Catholic Church can be seen in the background. A Shirley Chisholm Day Care Center operated at 333 14th until the end of 2014. A townhouse/condo development is coming in. Remember the red wooden house that used to stand at 359 7th Street, off Fifth Avenue? The house was demolished in 2013, and the lot was sold for $1,860,000. The lot has been empty for three years, while plans for a four unit/four story building have faltered. Amended plans were approved earlier this month, so I expect there'll be some action soon. The new architect is Gabriel Gingishvili, and the firm is MGM Creations Architecture. "MGM Creations Architecture is young design firm who at its core true believes Architecture is the base of our every day lives. Architecture at it's purest form inspires our souls, enlightens our minds and captures us as we travel thru our days. The principal idea is to create our spaces with a simple structure following what we here describe as the three F's of Architecture. Form + Function + Flow." We doubt the building on 7th will look anything quite like Mr. Gingishvili's residential work in Mill Basin, but it's definitely worth a glance. A group of about thirty men and boys who are sorting combustible refuse, mostly paper, and stuffing it into large sacks. 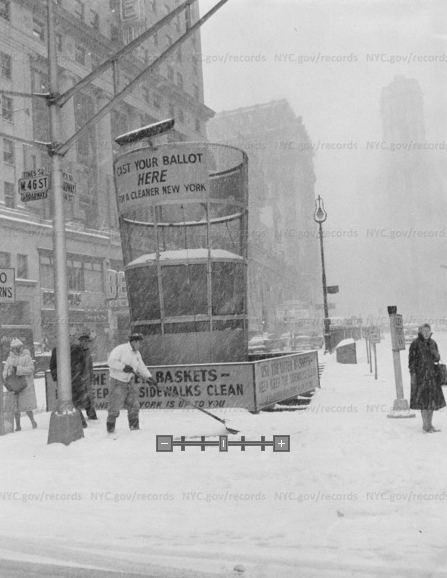 In the background a man in a hat with an emblem on it can be seen unloading trash from a large wagon. 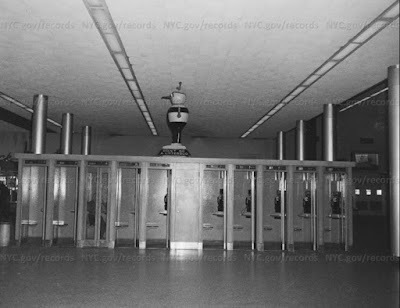 Location may be the New York City Sanitation Department's East 17th Street facility, or possibly the incinerator at West 47th Street on the Hudson River. I've really gone down the rabbit hole into sanitation archive mania, but before I give it a rest for a while, here's a Thomas Edison clip from 1903 (1907?). At the Greenwich House Music School, on Barrow, you can find an old (defunct) telephone booth, with grey-green pressed tin walls & ceiling, and worn smooth wooden seat & corner ledge. Whispers of a thousand conversations. After yesterday's Giant Litter Basket post, we continue the sanitation theme with a couple of films from the 1970's. They're rather different in tone, and the second one (more of a a PSA short) boasts a zippy period soundtrack. They weren't kidding about the size of the basket. Litter Bug figures & giant metal garbage bins were part of a 1960 anti-litter campaign, Operation Litter Bug. The baskets invited citizens to Cast Your Ballot Here For A Cleaner New York. 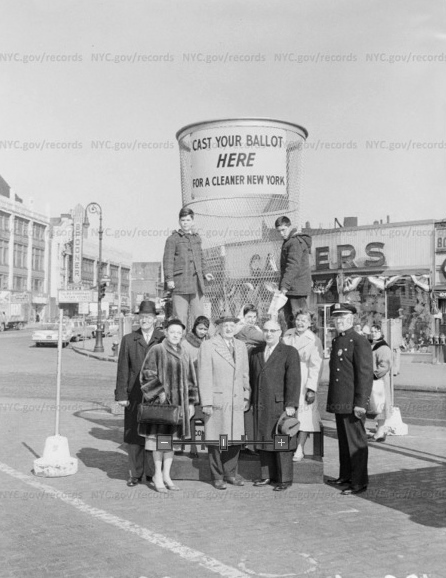 I don't know if the Times Plaza location was ever selected for the campaign, but the Basket popped up in plenty of other places. and here's maybe my favorite shot - a scene in which the Bug stands atop a row of (almost) empty telephone booths in the S.I. Ferry Terminal. 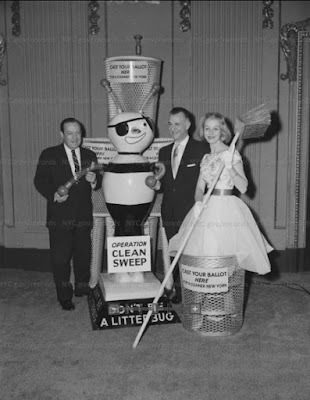 Why is the Bug facing sideways in that sinister manner, and who is the solitary figure perched in the booth? Truly this picture is the stuff of nightmares!! ... he largely shies away from commenting on New York City in 2016, except when we gaze out the window of his office near Columbus Circle. "You know, these buildings are disgusting," Caro says, motioning to the luxury high-rises. "No one seems to speak out against them. You wonder what New York is going to become." Much like the new East River ferry routes that should arrive in 2017, de Blasio claims a streetcar ride will cost the same as a swipe, but he can’t yet guarantee the swipe will include a transfer to or from the subway. This is a fatal flaw in the plan and one that will doom the Brooklyn-Queens Connector to a second-rate transit gimmick that cannot fulfill its ridership potential. How big would it be? More than 1.55 million square feet, combining the bulk of the B1 tower planned for the triangle currently including the arena plaza, plus the 439,050 square feet for the Site 5 development. It's supposed to be an office tower, but presumably would contain a significant amount of retail and--unmentioned, but a good bet--some condos. Thunder Ridge might feel a long way from Jerome Avenue in the Bronx or East New York in Brooklyn. But that area is part of the weird math that helps determine how affordable the apartments in the city's affordable housing plan really are. 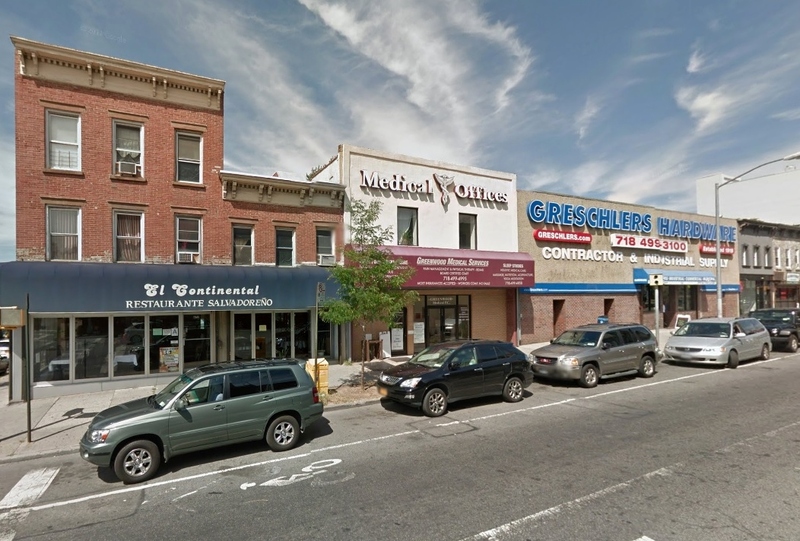 That's because Putnam County is, along with Westchester and Rockland counties, part of the territory for which New York City's Area Median Income, or AMI, is calculated. Hope the Breadfruit Tree Cafe gets this fixed soon. Late breakfast at the Bel Aire diner, a quick visit to Jamesie's Place, & a detoured ride home on the N. Always a delight to be back in Astoria. Two videos present rather different lifestyle priorities. 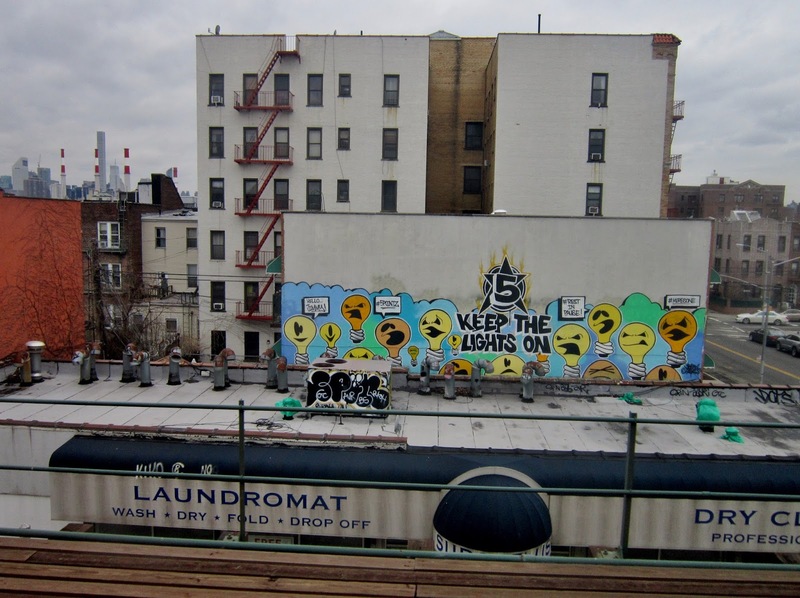 Lounging by your rooftop fire-pit, or working to save real neighborhood amenities? 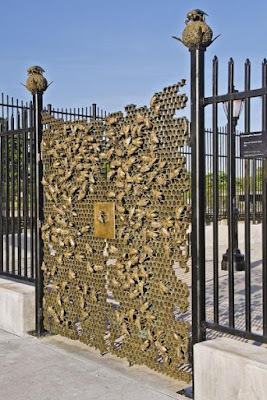 Instrata Park Slope offers an amenity-rich, luxurious residential living experience in a charming neighborhood imbued with Brooklyn’s true character. Instrata Park Slope is conveniently located near the Atlantic Av-Barclays Ctr transportation hub, Prospect Park and a host of branded shops, restaurants, and entertainment venues. Amenities include a stunning rooftop and resident lounge, extensive gym, pet spa, and resident parking. Community residents fighting against the loss of a full service supermarket on N. Slope's Fifth Avenue . 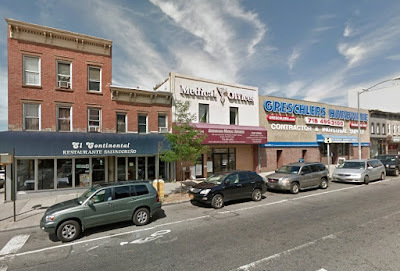 The medical offices at 668 5th, in between local favorite El Continental & Grescher's Hardware, are now being advertised for rent. The rental prices vary per floor, with first floor retail space listed at over $10,000 a month. The whole building is listed at $18,667. Up, up, up. I'm somewhat confused about what's happening at the nearby Caribbean restaurant Marleey's, at 700A Fifth. I believe they opened late last year, but what's the story now? No recent info on their Twitter or Facebook, & Zomato (formerly urbanspoon) lists the restaurant as temporarily closed. Every time I've walked by the shutters have been down, but maybe that's just bad timing. Any info? A favorite of mine - a green house, guarded by a tangled, urban forest. Sixteenth Street Brothers Grimm. I took a walk over to 19th Street, to see what was happening at the big construction site at 196-204. They've got foundations in now. Just up the block there's another green plywood fence in front of a building alteration in progress. Both this fence, and the ones for 196-204 block most of the view of the rear building at 206. Behind a more modern workshop, there's a smaller, older one with a cornice on which you can see E.A. Mulle(n?) & ... Sons? At first I thought it was & Sons, but now I think it could be something else. I've taken a few pictures before - maybe I can find one where the lettering is clearer. The brick structure is present on the 1903 E.B.Hyde map. I've looked around to try and discover what business operated here, but haven't found anything out. The most recent business listed at this address is Specialty Sheet Metal. Perhaps there was a tinsmith here when the older building stood alone.